- Will Duffy vs. Arminian Pastor Jaltus: Is the future open? - Related: Duffy radio interview on the film Calvinist and John Calvin Institutes Bk. 1 Chap. 18. Good evening and thanks for being with us tonight. I am Will Duffy and I’m extremely grateful that Matt Slick loves the Lord and agreed to partake in tonight’s debate. His website CARM.org has helped countless people. 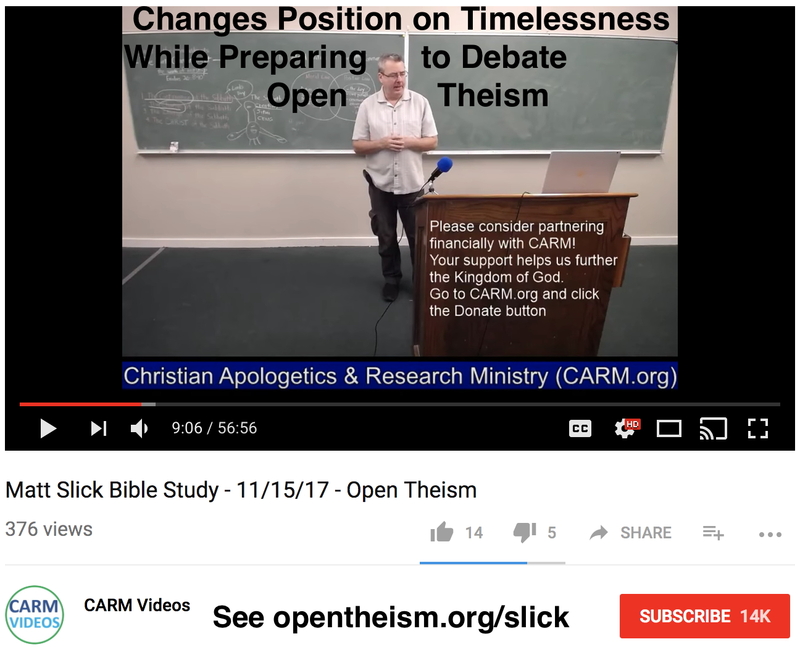 Tonight’s debate resolution is whether or not open theism is a proper representation of the God of scripture. I argue the affirmative, that open theism properly represents God. Before defining open theism, I want to make two bold statements. Bold statement #1: Only open theists believe in predestination and foreknowledge. and therefore does everything simultaneously and never does or knows one thing before or after another. as we believe God lives and acts in time, in sequence. Bold statement #2: Only open theists believe prayer can change the outcome of an event. If the future is settled, as my opponent believes, prayer cannot change the foreknown outcome of an event. Consider an extremely sick child. Prayers are offered up for wisdom on how to treat the child’s illness. According to the settled view, all the prayers offered for that child never had a chance to change the outcome. Why not? Because the actual outcome was settled because it was, as some believe, predestined, or as others believe, at least foreknown, before the foundation of the world, and by those views, nothing, not even God, could change it. Open theists believe that prayer can change the outcome of an event. Since the future is open, and not settled, God has the ability to intervene. He is not bound by the future, but rather, He can change the impending future. he prayed to God. And the text says God heard his prayer and decided to heal him instead. When God told Hezekiah that He would die and not live, He was telling the truth. But according to the settled view, He was not telling the truth, because the foreknown settled future was that Hezekiah would not soon die. But God did not lie. The future was not determined, but open. God healed Hezekiah because of his prayer, thereby changing what would otherwise have been the future. This is only possible if open theism is true. Christians throughout history, including Calvinists, Arminians and even some open theists, have long made a fundamental error in how they approach God and the Bible. They start with what humans have to say about God. If we give God the first word and allow God to speak for Himself, I think you will see that open theism properly represents the God of the Bible. So what is open theism? Open theism is the Christian doctrine that the future is open and not settled, because God is eternally free and inexhaustibly creative. The settled view, which is comprised mainly of Calvinists and Arminians, disagrees that the future is open and as a result claims that God cannot think a new thought and so His creativity is not inexhaustible but completed. Open theism is growing as Christians realize that its foundation is not based on man and our freedom, but on God and God’s freedom. I will show tonight that open theism properly represents the God of Scripture based on three fundamental truths: God’s free will, the Incarnation and that countless Bible passages read as if God Himself thinks the future is open and not settled. Let’s start with God’s freedom, His free will. Christians who believe the future is settled, like my opponent Matt Slick, are forced to abandon God’s free will. When they argue people can’t really choose other than what actually happens and claim human beings do not have libertarian free will, they don’t even think God has libertarian free will. For God to have free will, to be truly free, means God has the freedom and ability to think new thoughts, to write new songs, to design new butterflies, even to decree something new. But settled view theists believe God cannot do this. They believe the future is determined and settled, even for God Himself. God is essentially stuck in fate, similar to Zeus. My opponent tonight is a Calvinist. And Calvinists believe God freely and unchangeably ordained whatsoever comes to pass. So my opponent believes God no longer has the ability to do anything other than what He decreed. His creativity has essentially ceased. God can’t even think a new thought. So that’s about God’s Freedom. This is arguably the most significant event in God’s history. And it’s at the heart of the gospel of Jesus Christ, the most central doctrine in Christianity. I claim tonight that the Incarnation proves open theism. Settled view theologians have long held that God is outside of time, meaning He does not experience sequence. But that idea did not come from the Bible. That came from pagan Greek philosophy. And the Incarnation utterly refutes this claim. The Trinity existed through eternity past and God the Son was not yet the Son of Man. This is why the Old Testament says repeatedly that God is not a man or “son of man”. But today it would be heresy to claim that God the Son is not a Man. The Incarnation changed everything, permanently. God the Son became a man. He became the Son of Man. And while the Old Testament says repeatedly that God is not a Son of Man, Jesus in the New Testament refers to Himself as a Son of Man more than any other title. It was His favorite way to describe Himself. The Bible does not contradict itself. God can’t be both a Son of man and NOT a Son of Man at the same time. A change took place. And this change was the Incarnation of God the Son. He took on a human nature for the first time in His existence. He went from one nature (a divine nature) to two natures (both human and divine). The union of these two natures is often referred to by theologians as the hypostatic union. And God the Son did not have this hypostatic union of two natures in eternity past. The hypostatic union came about at the Incarnation, not before. And note that the sequential change here did not just affect God the Son. For example, God the Father also experienced sequence as His Son increased in favor with the Father, and He had become the Father of a Son with two natures. As you can see, the Incarnation irrefutably shows that God Himself lives in sequence. God has a past. In eternity past, the second person of the Trinity had only one nature and since the Incarnation, even right now in heaven at the right hand of the Father, God the Son has two natures and will have two natures forever. And finally, I’d like to give you a sense of the vast number of verses where God speaks and acts as if the future is open and not settled, and in contrast, a sense of the lack of verses that say the opposite. Preparing for the debate, I classified the hundreds of verses that show the future is open into 33 categories. I’ll share with you 7 of those categories and a few examples from them. The entire list is available right now at opentheism.org/verses. Settled view theologians, like my opponent, have no choice but to say these many verses do not mean what they actually say, and over the years, I’ve noticed they almost never offer interpretations of what these verses actually mean. Anthropomorphisms are obvious in Scripture. Like when the Bible says God brought Israel out of Egypt with a mighty hand and an outstretched arm, no one envisions a hand or arm from heaven picking up Israelites. The figure of speech there paints a picture that God remembered Israel, intervened and from heaven delivered them. No one should call every verse that contradicts their theology an anthropomorphism. But if all these verses are indeed figures of speech, what do they mean? How do they help us better understand God? Let’s find out tonight if the settled view position can find meaning for these verses or if they are all simply dismissed as figures of speech without meaning. So first, here is the list of categories of possible settled view verses, except there are no supporting verses for these categories. Not one. Next, that God created time: the Bible says that He created space, matter, light and life, but not that He created time. The next category is verses that say that God knew each of us before we were conceived; He knew us in the womb, and the fallopian tube, but the Bible doesn’t say He knew us before that. And there are no verses that say that God exists in the past, or in the future. And there are no scriptures showing that God can change the past. but He never does, go back in time to intervene. The next category of verses that don’t exist, are those that would say that God knows everything that will ever happen: the Bible never says that. And finally, that God decreed everything that will ever happen. That only comes from philosophy and theologians; not the Scriptures. So that’s the seven categories of verses that don’t exist. Now, here are 7 categories out of the 33 of verses that show the future is open. because He would rather forgive people, than punish them, if possible. He then says, repent, so you don’t have to die. That’s a prophecy, that God doesn’t want to come to pass. The same exact thing happens in the Book of Jonah. The second category has verses showing that God exists in time, through duration. Like Jesus is waiting in heaven until His enemies are made His footstool. It says that all over the Bible. and from everlasting to everlasting. That’s never-ending duration, not timelessness. The third category shows that God has qualities that can only be had if He exists in time. Qualities like patience, and hope. The Bible says that God is patient. He can’t be patient, if He exists outside of time. Are these all anthropomorphisms? The Bible calls Him the God of Hope. How can you have hope if the future is settled? Then, the dozens of verses where God Says He Changes His Mind, that’s another category. In Genesis 6 God says He is sorry that He made man, He repents that He made them, because they became so wicked, so He actually wiped out the population of the Earth. That’s a change of mind. for he has turned back from following Me.” So He deposed him. in favor with God.” God the Son also increased from one nature to two, divine and human. And then Hebrews 5 says He learned obedience by His suffering. And the seventh, a list of verses showing the Things that God became. He became the Creator, when He created, when He became sovereign. He became flesh, a Man, at the Incarnation; He became our Savior, as the Bible says, twice. To conclude, as you can see, the Bible overwhelmingly communicates that the future is open and not settled. And the Bible is not just short on verses that state God is outside of time and knows everything that will ever happen; it’s completely void of any such verse. These truths show that Calvinism and Arminianism then are theologies that represent the God of philosophy and open theism represents the God of Scripture.